When it comes time to plan a residential move, whether you are moving locally or to another state, it pays to work with a reliable, reputable residential moving company that can provide you with all of the services that you require to make your move successful. In addition to working with moving companies in Massachusetts that can meet all of your needs, you should also consider making your move in conjunction with a mobile storage company and purchasing moving protection coverage to ensure that everything gets safely and securely to your destination. Some people like to buy packing supplies and do all of their own packing. Others like to hire a company that will take care of it all for them, including marking the boxes to make sure they get unloaded into the right rooms when they arrive at their new residence. Whichever solution you prefer, there are certain tips that you can try that will help you to have a stress-free and problem-free move. While there will always be little bumps in the road, the more that you can do in preparation before the residential moving company shows up on moving day, the less problems you will have during the move. 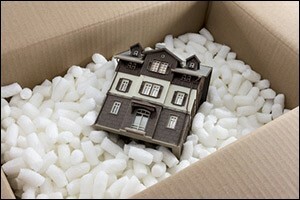 In the weeks and months prior to your move, take this time to do a thorough clean and inventory of your belongings. One tried and true method for reducing the amount of items that you will need to have moved with your moving companies in Massachusetts is to create four boxes or piles: keep, toss, donate and store. The keep pile should consist of the things that you want to save that can be packed in advance because you don’t really need to use them at the moment. The toss pile is for things that you want to throw away and the donate pile is for things that are in good condition that you don’t want that can be donated to a local charity. The store pile can be made up of seasonal items or items that you don’t use frequently that can be put into a container for the mobile storage company ahead of your move. It can be easy to become distracted when going through all of your belongings. Finding things that you haven’t seen in months or years, items that bring back memories or that were given to you by someone special – these can all cause delays in your sorting and packing. Make sure to keep your focus on the task at hand and tell yourself that you will go through all of those personal items when you unpack them again at the new location. Whether you hire a residential moving company to pack your things and move them for you or if you decide to pack up your items yourself, make sure to purchase quality packing materials. Boxes in multiple sizes, packing tape, a large marker for marking the boxes, scissors and specialty items, such as wardrobe boxes, television boxes and containers for artwork should all be employed. Speak with the moving companies in Massachusetts about the types of materials that they are using and find out about moving protection coverage for valuable items. As you pack up the items from each room, consider making an inventory list of everything that goes into each box. Label the boxes by room, but add a numerical or alphabetical “code” to each box that will help you locate specific items once you reach your destination. The professional residential moving company experts do this when they pack for clients to ensure that nothing gets left behind, lost or misplaced during the moving process. Why not borrow a tip from the playbook of the pros? Make sure to make arrangements for your pets on moving day. Consider boarding them the day before so they will be out of the house and away from all of the stress of moving when the moving companies in Massachusetts show up to take care of your move. If you are moving out of the area, look into hiring a pet traveling service or transport your pet with you in the family car when you follow the moving truck to the new location. Don’t forget to have your pet carrier, leash, food, bowls, toys, bedding and any other necessities to help you take care of your pet as you move to your new home. If you are planning a move in the Southeastern Massachusetts, Rhode Island or Connecticut, look no further than the professional residential moving company of Conlon Moving & Storage. Located in Seekonk, Conlon Moving & Storage is one of the top moving companies in Massachusetts. We can help you plan your local, interstate, coast-to-coast or international move. We even provide services for commercial business relocations, offer full moving protection coverage, feature mobile storage company services and much more. Give us a call at 508-336-7766 and schedule a FREE in-home estimate for your upcoming move.